It was Tuesday afternoon October 16, 2012 when I returned home from work. The previous two or three days had been extremely windy, but still I had been out hunting every evening. The wind finally came to a stop, so like every night I went out. I usually do all my hunting on family property in another town about a half hour from where I live. Now by the time I get home, the time is around 5pm and it's dark by 7pm. I have a trail camera behind my house on the edge of a local farmers field where I recieved premission to hunt. On my camera I have a few different black bears coming by, a ton of doe and fox pics, and a few small bucks, but no shooters. So instead of driving a half of an hour to hunt, when I only have two hours, I have been sitting behind my house hoping a bear would come by. On this evening I get into my stand and for once this season my tree isn't swirlling. My stand is on the edge of a corn field which is still standing. What little breeze there is is right in my face. It wasn't very long when I saw a deer come out of the thick brush heading into the corn field. When it came out, I couldn't believe how big the body was. The sunlight was hitting it just right so I couldn't see the antlers. The deer was 178 yards away according to the range finder and since I really couldn't see any antlers I wasn't that concerned with the deer as it walked into the corn and disappeared. Then a doe came by my stand within shooting range. While I was watching her, I looked over where I saw the bigger body deer go into the corn and saw it standing at on edge of the corn field facing away from me. The sun had gone behind the clouds now and there were no shadows. When the deer started walking I thought, "That tree is moving with the deer." Then it hit me that it was his antlers. He was going away and almost 190 yards away now. I looked at the time and I had about a half hour left. I decided with the wind in my face and a standing corn field to get downout of the tree and go after the deer. When I got down, I slowly walked around the edge of the field and when I got to where I had last saw the deer I stopped. Looking around for a minute wondering where it may have gone I heard it chomping on the corn. When I finally could see him it was just the tips of the left side. I knew he was a shooter as soon as I saw him. He was in the corn heading to the edge with his head down. I was on the edge in the wide open on the ground. I came to full draw and waited for what seemed like forever. When he came out of the corn he was broadside at 15 yards and stopped when he saw me. He stood there while I locked in and decided to take a step when I released. The shot hit a little back. When he stepped he was also turning to his right and running straight away. This is when I saw how wide he was. The arrow went in back, but went up through the goods. He ran about 40 yards, stopped, looked back and then ran up the edge of the field towards the road and river where they pinch. I listened for a while and heard no water splashing so I knew he never went across. I went back around the edge of the field to where my stand is and then right to the house. I called up my dad and he came down with my brother to help me and my girlfried, Shannon, look for the deer. Yeah thats right... I got her to help track. By the time we all got to looking it had been almost an hour. When we found blood it was very small and bright red. I thought, "Liver?" The entire blood trail was small drops, but he only went maybe 60 yards. When we found him he had nose dived into some thick grass and brush. It looked like a doe. Everyone said I was full of it. I had told them how big he was and they saw a doe. Oh no! I reached into the grass and tried to pull him out, but needed some help... he was in good. We couldn't believe it. I had no pics of him on the cameras and ever knew he was there. I showed a few neighbors the deer and one of them who owns land that borders the south end of Letchworth Park has numerous pics on his camera of this deer. 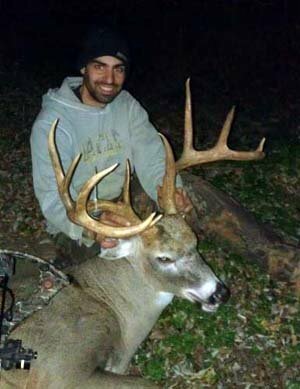 The deer was green scored at 157.5 and would net around 146. Best deer I have ever taken with a bow or a gun.